Cause for A Hog Roast Sussex Celebration! Weekends are always jam-packed for us here at Hog Roast Sussex and this weekend was no different! Our first event of the weekend was catering at a private party for Alicia who was celebrating landing a new job- a wonderful excuse for a Hog Roast Sussex event! Alicia had recently graduated from university and had spent the months since graduation working hard gaining the relevant experience and improving her CV until she was finally offered her dream job on a graduate programme for the civil service. Her parents were immensely proud of her, and rightly so, therefore they wanted to throw her a celebratory party with close friends and family to congratulate her. We would be catering from the families own home, just on the outskirts of Sussex, for approximately fifty guests. The notorious April showers had arrived and so we made sure to pack our handy gazebo from which to cater under if needs be. We always like to be prepared at Hog Roast Sussex, especially when catering outdoors as we will always go the extra mile to make sure we can cater no matter what the weather decides to do! The party menu consisted of our signature Hog Roast Sussex rolls. These rolls are made of our slow roasted hog meat, cooked for several hours in our hog roasting machines. When the meat is beautifully tender our chef delicately carves the meat as it struggles to hold its shape due to being so mouthwateringly succulent. These warm slices are then placed in freshly baked bread rolls before topping with layers of crispy crackling. 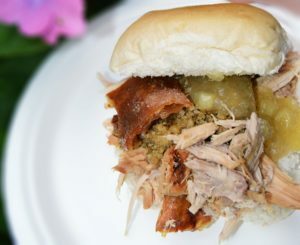 The Hog Roast Sussex sandwich isn’t complete, however, until we have added a delicious dollop of our homemade applesauce along with a spoonful of sage and onion stuffing…delicious! From everyone at Hog Roast Sussex, we would like to wish Alicia another congratulation and we can’t wait to hear how you get on with your new job!